Over the last few years of fostering I have had my share of wild adventures and heart wrenching tales. There have been ups, downs and many in betweens. But through it all, one thing has always remained the same – the desire to place each dog into an amazing forever home where they would be a part of the family, no matter how big or small, for the rest of their lives. If you have been following Mingo’s story, you know all about the incredible odds this little dog was up against. Due to life being incredibly crazy and busy for me, I haven’t had a much of a chance to update her tale. To sum it up…she’s a survivor in the most true sense of the word. When Mingo’s story was first announced back in September, I was contacted by a very nice woman, Erika, who was incredibly keen on hearing about/keeping up with Mingo’s story. While she was interested in the possibility of adopting her, Erika was very understanding that Mingo still had a lot of recovering to do and may not be ready for quite some time. We talked about her recovery and the adoption process and Erika shared about her own dog, Milo, who looked like he could be Mingo’s twin. I could tell Milo was incredibly loved by his mom and dad and knew that Mingo would have an amazing home if adopted by them. So while it was still very early to start seeking adopters for Mingo in September, I had a very good feeling that I really wouldn’t need to because this family seemed like the perfect fit. After her initial surgery to fix the stricture, Mingo’s recovery was dicey. While she had a handful off good days, she had even more days that were just plain terrible. Different meds and a change of recovery plans were put in place, but she just never seemed to get better. She continued to regurgitate quite often and was constantly hyper salivating. She’d come home to me and do ok for a couple days only to go downhill and end back up spending a few days at the hospital where they would monitor her and try to get her stable again. Through it all and despite her obvious discomfort, she always remained incredibly sweet and determined to keep up the fight. During one of her stays at the vet hospital, she was given an ultrasound and the results shocked everyone. There was an embedded object deep inside her throat. While it was a totally appalling discovery, it was also the final piece to the mystery of why Mingo didn’t seem to be getting any better, despite her first surgery. 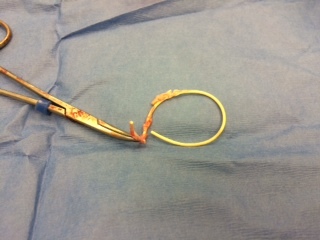 The decision was made without hesitation, Mingo would be having a second surgery to remove this object. This is what was pulled from inside her neck during the procedure. As you can see, it looks like the top part of a balloon or other similar object. It seems that this was placed on Mingo when she was a very small puppy and as she grew…the object didn’t. The band ended up sawing completely through her trachea, which gradually healed around it as it passed through to the other side. 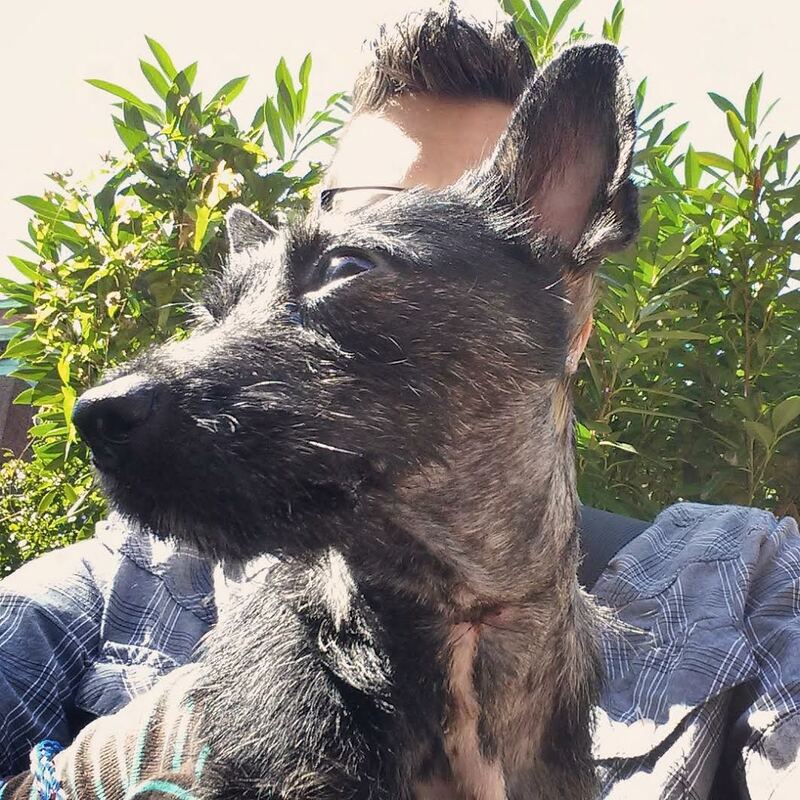 The vets who had preformed her initial trachea surgery didn’t see the object because so much scar tissue had built up around it, virtually making it invisible. This poor little dog had lived almost her entire life in extreme pain and discomfort. The good news is that the surgery was a success, the entire object was removed and Mingo was once again on her way to becoming a ‘normal’ dog. After over 3 months of recovery time, I am very pleased to announce that Mingo has made an incredible turn around. Her energy is through the roof and she loves loves loves playing with everyone she meets! She is now living life to it’s fullest…in her new forever home. Yep, you read that right. Erika and I kept in touch over the months and as soon as Mingo was well enough, we all got together to meet and spend some time together. 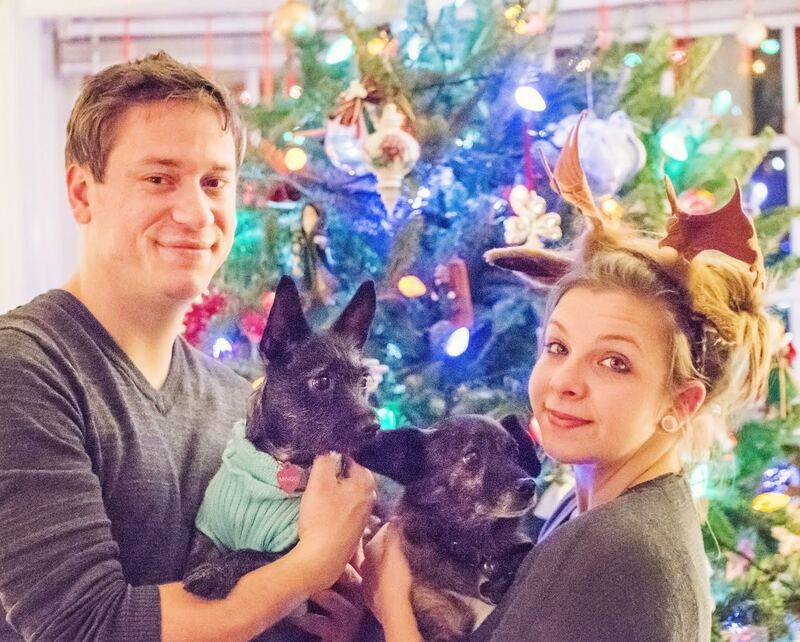 Of course it went smashingly well and they were 100% on board to adopt. Erika and Jeremy both understood the challenges Mingo still faces and were willing to continue to care for and help her be a happy, healthy dog. 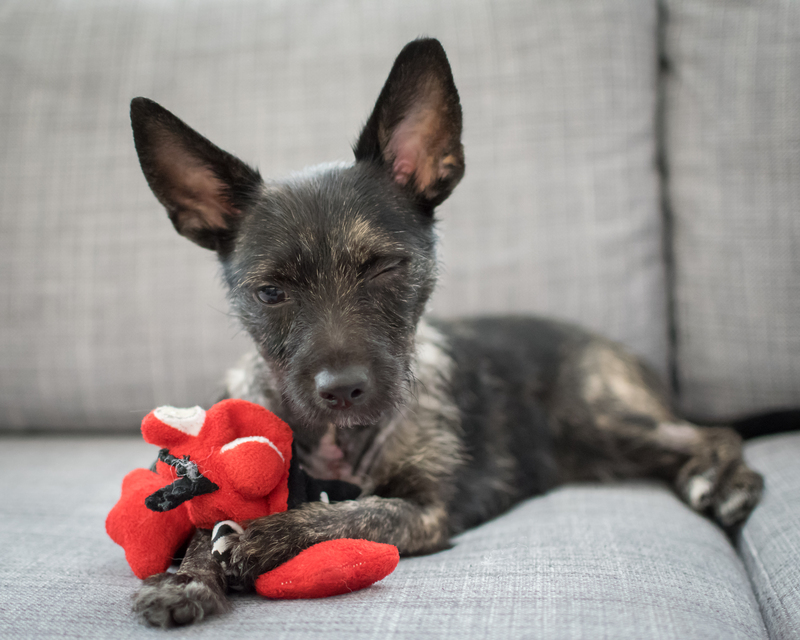 (While technically Mingo is recovered, due to the trauma of the embedded object she has laryngeal paralysis, which needs to me monitored) She was scooped up into her awesome forever home right before Christmas…talk about one of the best gifts ever! Through it all, Mingo remained vigilant. I kid you not, we all could really learn a lot from this amazing girl. She’s one of the happiest, goofiest, most loving dogs I have ever had the opportunity to foster. She’s curious about everything. She’s smart, playful and despite all insanity that she went through, she still trusts every single human she meets. 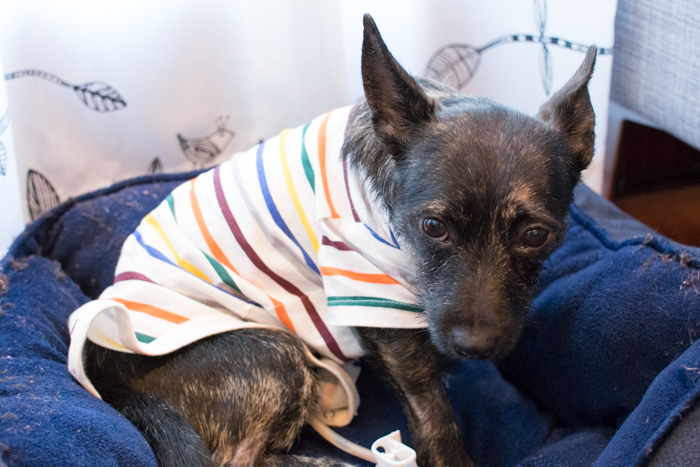 While Mingo had a rough start at life, she’s now exactly where she was meant to be…in an incredible home with a family that will love and cherish her forever! I can’t thank PAWS and VSEC enough for supporting and providing all the medical care Mingo needed. Mingo survived because of their dedication and life saving efforts and so many people (and dogs) are truly grateful. Check out these amazing pics from her mom. Interested in getting some amazing shots of your little one? Head over to littlebluebox to see Erika’s awesome work and set something up for yourself!